New Jersey born clinical psychologist Roberta Isleib took up writing golf mysteries to justify time spent on the links. Her first series, featuring a neurotic professional golfer and a sports psychologist, was nominated for both Agatha and Anthony awards. Advice and Dissent, the first book in her new series starring a Connecticut psychologist and advice columnist, will debut in 2007. Roberta is the president of the New England chapter of Sisters in Crime, on the national board of Sisters in Crime, and co-chair of the 2006 New England Crimebake. 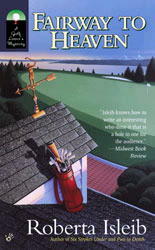 Final Fore (Berkley 2006) is the fifth (and for now, final) installment in the Cassie Burdette golf mysteries. Cassie has a big date with US Women’s Open, the most prestigious and stressful women’s golf tournament in the world. An unwelcome invitation to play in a men’s event adds to the stress, and unleashes an influx of fan and hate mail. As the pressure from both her controversial decision and her first appearance in an LPGA major mounts, Cassie also begins to suspect she is being stalked. When a young golfer dies in suspicious circumstances, Cassie begins to realize that competition can truly be murder. In summer 2004, I spent a week on the Mount Holyoke campus researching the book to get the ambiance just right. Sometimes you get more than you wanted – for example, a first-hand experience of the springs in the dorm mattresses! The United States Golf Association wasn’t so keen on giving a murder mystery writer a press pass, but the former sports editor at the New Haven Register helped me out. In Final Fore, Cassie is finally starting to make headway with her family and her golf game, but the pressure of this event threatens to derail her fragile composure. 2. Can you give us a sense of what you’re working on now? When Dr. Rebecca Butterman returns home to find her neighbor an apparent suicide, she’s wracked with guilt. As a psychologist and advice columnist, she should have been able to help the young woman. But the girl’s mother suspects foul play, and soon persuades Rebecca to investigate. Before long, the newly single Rebecca wishes she had someone to advise her as she navigates the world of speed-dating and web-blogging, where no one is who they claim to be. As she uncovers the family secrets that tormented her neighbor, she’s forced to confront her own personal tragedies. As much as I miss Cassie and company, I’ve very much enjoyed writing something entirely different. (Although the protagonist was introduced in A Buried Lie and Putt to Death. And Cassie makes a tiny cameo appearance in this new book – fair is fair.) The psychology angle is quite familiar to me, as I had a private psychology practice for many years. As for the advice column, I’ve always loved reading them. And family members who shall go unnamed claim that I give more advice than anyone ever really wants. Maybe these books will be a productive channel for that urge. Now I must turn my energy to Preaching to the Corpse, Rebecca Butterman’s second outing. For me, the greatest pleasure is having written, rather than the actual writing (which can be agonizing). And then hearing from readers who have enjoyed the work or connected with it in some way or who just really ‘get’ what I was trying to say during those solitary hours hunched over the keyboard. I heard recently from a professional golfer who had been at the Taste of the LPGA, a party described in book two, A Buried Lie. I must have taken pretty careful notes because this woman recognized herself and th chef’s booth at which she’d been stationed, poking parmesan wafers into martini glasses full of lobster macaroni. She was miserable – just like Cassie. There have been many other pleasures too: the amazing network of writer friends I’ve developed, meeting readers and fans, seeing the actual books on bookstore shelves, the Agatha and Anthony nominations, a fantastic feature article in Sports Illustrated ... I could go on and on. Maybe try publishing fewer books. Then put more energy and money into getting the word out about those. It’s demoralizing to invest so much of yourself and your time into a book and watch it wither on the shelf because no one’s heard of it. 6. Are there any forgotten mystery writers you’d like to see in print again? Abigail Padgett – intelligent, gorgeous writing with wonderful characters. In my first novel, Final Round, Cassie was blocked from developing her own potential as a golfer by her family and emotional ‘issues.’ So she caddied for a rookie on the PGA Tour instead. As the mystery series progressed, I imagined her working on her family baggage and then joining the LPGA tour. After eighteen months of pounding the pavements, I found a literary agent to represent the book. While she tried to sell the manuscript, I took Cassie to the LPGA sectional qualifying school in Florida to research the sequel, Six Strokes Under. (This tournament is the path to breaking onto the tour.) While we were there, my agent called. Good news! A major publisher wanted a golf series. But the editorial board preferred my character to be a golfer, not a caddie. No dice. They wanted her playing now. Second point, Cassie’s mystery was a great Cinderella story – she’d start out in a man’s world, and reach down deep for the nerve to play herself. No dice. The editors wanted a major player, not some man’s support. No dice. So I put Cassie in psychotherapy. She didn’t want to do it, but I explained that she had to get some things sorted out so we could get her through Q-school. Final Round went back in the drawer. And Six Strokes Under was published in 2002.